Minerals in Alkaline Based Foods - Are Fruits Alkaline? Alkaline based foods leave behind an ‘alkaline ash’ residue in the body, once they have been eaten and digested. This alkaline ash is dependent upon the mineral content of the food. The minerals potassium, calcium, magnesium, sodium, copper, zinc, iron and silver are all alkaline and so generally, foods containing these are classed as being alkaline. In contrast, the minerals sulphur, chlorine, phosphorus, fluoride, silicon and iodine are acidic and therefore foods containing these have an acidic effect on the body when consumed. See my Alkaline Foods List for a comprehensive guide to alkaline foods. Many fruits contain alkaline minerals but are not actually classed as being alkaline foods. This is because the ‘good’ effects of the alkaline minerals are outweighed by the ‘bad’ acidifying effects of the high sugar content of the fruit. 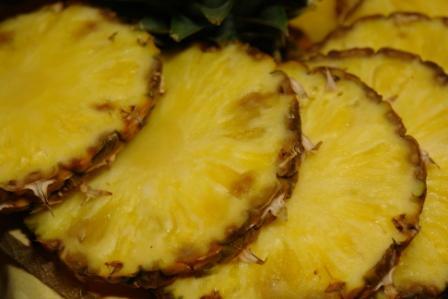 For example, think of how sweet a pineapple is: The large amount of sugar (even though it's naturally occuring) means that pineapples are acidic foods. Fruits are not as acidifying as processed foods or meat and dairy products because they still contain a high water content and alkaline minerals, but they do need to be eaten sparingly and viewed as moderately acidic foods because of their sugar content. The only truly alkaline fruits are avocadoes, tomatoes (kind of like vegetables anyway aren’t they), lemons, limes and grapefruits.